The Mutoh RJ-900X has become the industry standard for 44-inch dye sublimation printing. Graphics One has compiled a presentation with information covering the Mutoh RJ-900X Dye Sub printer, GO NeoTack Dye Sub ink, GO Xtreme Dye Sub Tack paper, VV-44 Roll-to-Roll Calendar, Metalnox EL 900 and Metalnox PTS 8000-Single. Add installation and service and a user has the best 44-inch dye sub solution in the market, all from Graphics One. The presentation also includes information regarding the EPSON F7060 44-inch dye sub printer and how it compares to the Mutoh unit. The presentation can be found at: Presentation Covering Mutoh RJ-900X and Accessories. 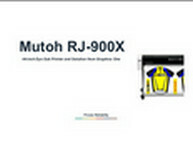 Additionally, if you would like to review further information the Mutoh RJ-900X, you can find this information on the Graphics One website at: RJ-900X Info.